Theres big news, and you want to celebrate. What could add more to the thrill of it all than this bright, bold and beautiful bouquet? 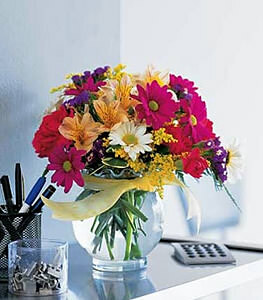 Richly hued alstroemeria, carnations, daisies and solidaster arrive in a clear glass bowl decorated with a yellow ribbon.